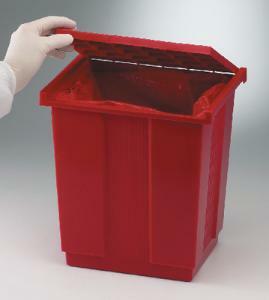 The bright red color of the small Biohazard Disposal Can makes it easy to identify as a safety disposal container. It is suitable for for biological/biohazard materials, broken glass, recyclables or other waste. Sized for benchtop or floor placement. All plastic parts are molded of polypropylene. 14" x 19" autoclave bags fit perfectly over a stainless steel internal wire frame to keep bags open for safe and easy access. Size: 9" x 12" x 111/2".